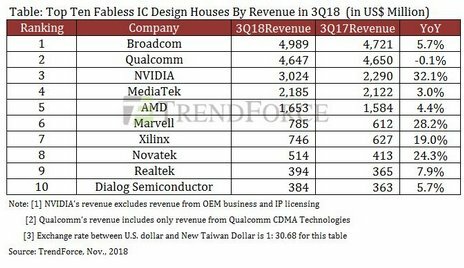 November 26, 2018 -- TrendForce announced the ranking of top 10 fabless IC design houses worldwide based on their revenues for 3Q18, among which Qualcomm was the only one to post a slight decline. The other nine companies all registered year-on-year growth in their revenue, driven by segments like networking, data center, automotive application and consumer electronics. Taiwan-based IC design houses in the ranking, including MediaTek, Novatek, and Realtek, showed remarkable performances in the third quarter due to stock-up demand from consumer electronics makers for the upcoming holiday sales. MediaTek has recovered from the revenue decline since the second quarter this year and grew by 3% in the third quarter. However, the only company in the ranking to see a drop was Qualcomm with a revenue decline of 0.1% YoY in 3Q18, “Qualcomm has adopted an aggressive product strategy, introducing five new processors with different market positioning by the end of the third quarter,” says senior analyst CY Yao from TrendForce. Its comprehensive product ranges also contributed to the shipment growth. However, the slowdown in the global smartphone market has resulted in lower prices, leading to a drop in Qualcomm’s revenue. The largest move upward in the revenue growth came from NVIDIA, which benefited from strong momentum in segments like gaming, professional vision, data center and automotive applications. Particularly, a remarkable revenue growth of 65.3% YoY was recorded for NVIDIA’s data center IC business in the third quarter. Following NVIDIA, Marvell registered the second highest revenue growth. After the acquisition of Cavium, Marvell’s revenue increased by 28.2% YoY in the third quarter, which brought Marvell to the sixth place in the ranking, surpassing Xilinx. The design houses headquartered in Taiwan kept pursuing better performances during the past quarter. MediaTek registered a rise of 3% YoY in sales in 3Q18, thanks to its continuous adjustments in product mixes. The company has allocated more capacity to its products on 12nm process and improved the cost structure of processors. It turned out to achieve a gross margin of 38.5% in the third quarter, the highest quarterly margin since 2016. On the other hand, Novatek’s SoC products received wider market reception, benefited from the favorable demand from global TV market. As for Realtek, it showed a growth of 7.9% YoY in the third quarter, driven by the growing networking market in China and the coming of year-end sales. Looking ahead to 4Q18 and 1Q19, Qualcomm will continue to deploy its aggressive product strategy in segments like RF transceiver components, automotive electronics and the Internet of Things. However, it remains to be seen whether the product adjustments can moderate the loss brought by the slowdown in the global smartphone market, says Yao. On the other hand, MediaTek has entered a period of stable development after one year of adjustments in operation and product portfolio, despite the impacts from lower smartphone sales. Despite the highest revenue growth among the top IC design houses, NVIDIA was short of the market expectations in terms of the results of revenue due to the lower-than-expected gaming sales. The gaming segment always contributes to the majority of NVIDIA’s revenue. For instance, graphics cards for gaming represent 60% of the company’s sales in 3Q18. However, the decreasing demand for cryptocurrency mining has resulted in excess Pascal mid-range gaming card inventory in the channel. In response, NVIDIA is bound to clear out inventory as soon as possible to facilitate the better sales of its new graphics cards with Turing architecture GPU. Therefore, NVIDIA may anticipate a period of adjustment in the near future with the revenue outlook impacted, as a result from selling the excess channel inventory of midrange Pascal products. Fill out this form for contacting a TrendForce representative.